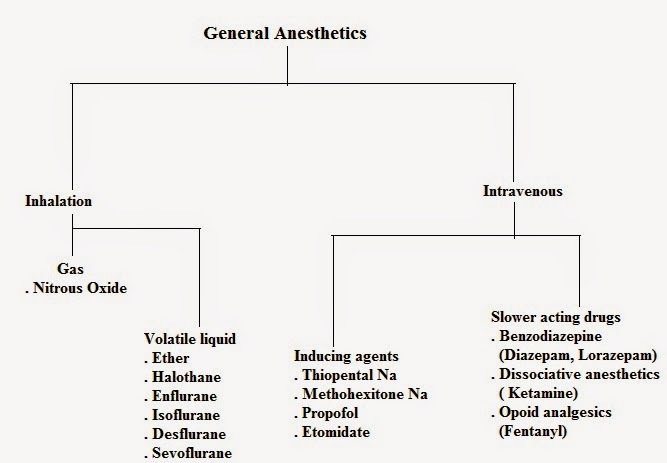 General anesthetics are drugs generally used for the purpose of reversible loss of consciousness (especially in case of surgery). 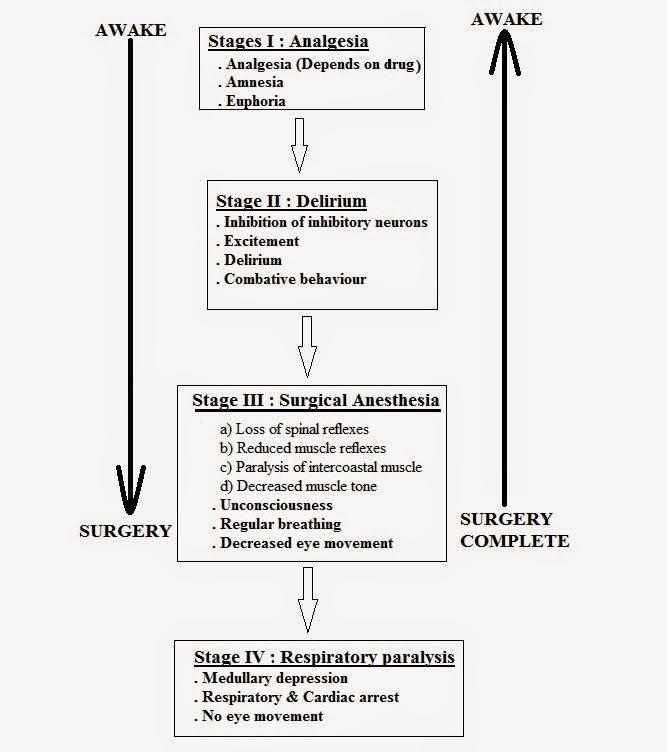 Before studying general anesthetics it's mandatory to understand the stages of anesthesia in human being. Anesthetic first saturates the alveoli. After the saturation of alveoli, it enters the blood. This depends upon blood/gas partition coefficient. Higher the blood/gas coefficient more time will be required for the saturation of blood (Induction time high). After saturation of blood, anesthetics enter in the tissue (including brain) & anesthesia achieved. This also depends on tissue/blood partition coefficient. Minimum alveolar concentration (MAC): Concentration at 1 Atm. pressure of a anesthetic in the alveoli that is required to produce immobility in 50% of adult patients subjects to surgery. Increase to 1.3 MAC = Immobility in 99% patients. As at equilibrium, con. in alveoli is equal to the con. in brain (site of action), hence MAC is used represent the potency of anesthetic. a) Meyer-Overton theory: In 1900, Hans Meyer & Charles Overton suggested that the potency of a substance (anesthetic) is directly proportional to its lipid solubility/partition coefficient (unitary theory of anesthesia). Later, postulated, anesthetics interacts with hydrophobic portion of membrane ----> distortion of Na+ pumps ------> Anesthesia. 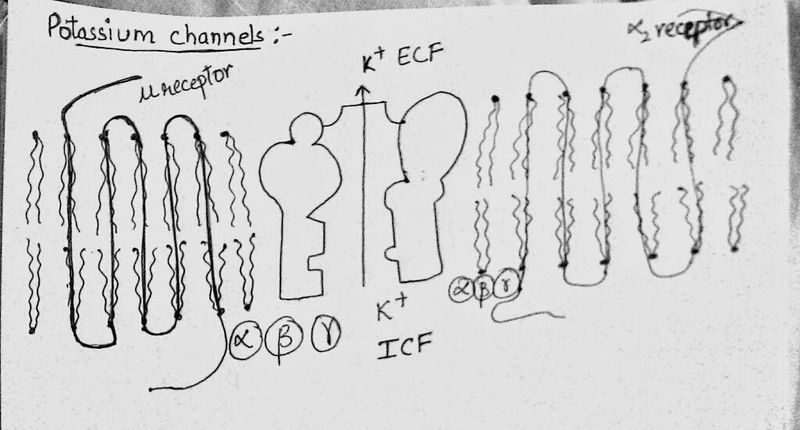 In the presence of anesthetics, membrane bloat & squeeze over Na+ channels ----> Interferes with depolarization. Not all lipid soluble anesthetics are potents. b) Stereochemical aspects: Isolurane, Desflurane, Enflurane all contains chiral carbon ------> (+) Isoflurane is more potent than (-). This is the most common route of mechanism of action of general anesthetics. Inhalation anesthetics acts by increasing GABA con. at GABAa receptor & stabilizing the GABA-receptor complex. 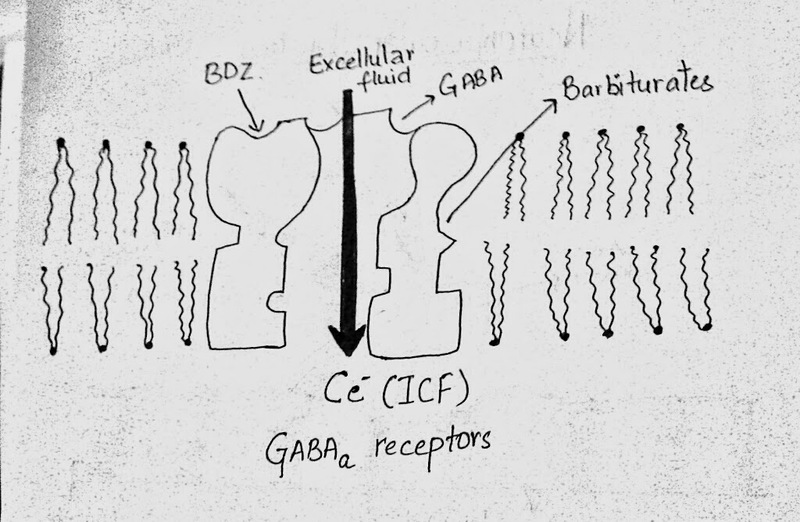 There are two receptors : GABAa & Glycine, both of which are inhibitory in nature. Isolfulrane, Benzodiazepine,& barbiturates acts by this mechanism. Most important is ligand gated Na+ channel in N-methyl-D-aspartate (NMDA) receptor complex. Halothane & Ketamine antagonise this receptor. These act by increasing K+ con. in ECF from ICF. Opoid analgesics & alpha receptor2 agonists acts by this pathway. Alone not used as low potency. Induction & recovery quick (low blood solubility). Thiopentone is used along for induction. Low effect on respiration, BP % heart. Increased irritation & inflammable (Not used in developed countries). 2-4% for induction & 0.5-1% for maintenance. Cough suppression & bronchodilation- Suitable for asthamtics. During labour: Increased delivery & blood loss. 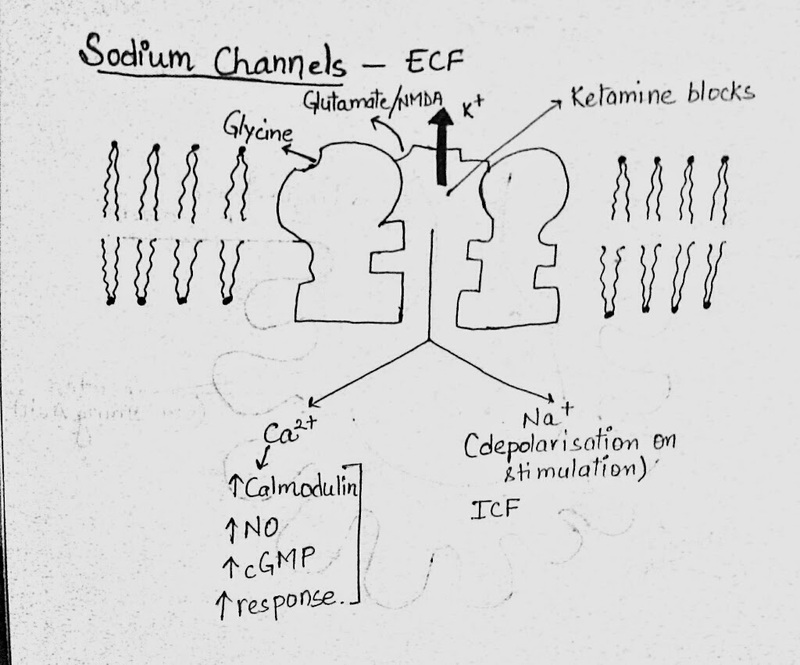 Malignant hyperthermia: Abnormal RyR (Ryanodine receptor) Ca channels. Increased release of Ca2+ -------> Increased muscle contraction & heat (Succinyl choline increase the symptoms). IV dantrolene + O2 inhalation is used for the treatment. Safer in patients with myocardial ischemia. Other properties similar to isoflurane. Ultrashort acting thiobarbiturate. High solubility in water & must be prepared fresh. Increased lipid solubility reaches brain quickly. Thiopentone & succinylcholine reacts chemically- Should not be mixed in same syringe. Bradycardia common otherwise safe drug. Midozalam- Slower & faster acting. Feeling of dissociation from one's body. Acts at cortex & subcortical region. Increased heart rate, blood pressure & carbon monoxide (Dangerous in hypertensives). 3. Fentanyl: Related to pethidine.